tl;dr: After a few months of relative stability, we saw lots of movement in November, to the downside. NEM, Ripple, andStellar and perform least horribly in November. Bitcoin Cash, easily the worst performer of the month, takes an absolute beating. Overall Stellar still on top. Click here for full blog post complete with charts, graphs, and charts of graphs. Instead of hypothetically tracking cryptos throughout the year, I made an actual $1000 investment, $100 in each of the Top 10 cryptocurrencies by market cap as of the 1st of January 2018. It began as a lazy man's Index Fund (no weighting or rebalancing), but I've moved away from that terminology as things have changed quite a bit since January 1st, 2018 (plus the term "Index Fund" seems to bring out the shills trying to sell their own Crypto Index Fund product). My experiment is less technical, more fun (for me at least), and hopefully still a proxy for the entire market- or at the very least an interesting snapshot of the 2018 crypto space. I'm trying to keep it simple and accessible for beginners and those looking to get into crypto but maybe not quite ready to jump in yet. Buy $100 of each the Top 10 cryptocurrencies on January 1st, 2018. Run the experiment 365 days. Hold only. No selling. No trading. Report monthly. We could file November under "Be Careful What You Wish For." After a relatively dull September and October crypto watchers were feeling antsy and predicted a big move either up or down. We definitely got some movement in November, but not the positive kind: crypto absolutely tanked this month. As for this experiment, if September and October were a slow bleed, this month was akin to losing a limb: I am now down 84% since the beginning of the year - my $1k investment is now worth $161. November "Winners" - No one really. Performing least horribly were NEM, Ripple and Stellar, down -18%, -22%, and -29%, respectively. Each moved up in terms of ranking as well. November Losers - For the second straight month, Bitcoin Cash lost, but this month was something special. It was absolutely crushed, losing -62% of its value in November. Overall update – Stellar solidly in lead, BTC a distant second. Cardano and Bitcoin Cash at the bottom. Even though Stellar is down -50% for the year, it remains squarely in the lead, followed distantly by Bitcoin down almost -70% for the year. This is not a surprise to anyone who's been following the experiment - Stellar has been one of the strongest cryptos most if not all months this year. Although Cardano and Bitcoin Cash are the absolute worst performers at -94% and -93% respectively, they are closely followed by NEM IOTA and Dash. The takeaway? 5 out of the 10 cryptos that started the year in the Top Ten have lost over 90% of their value. We had a lot of movement this month in terms of ranking. The Ups were Stellar up from #6 to #4, NEM up from #17 to #15, and Ripple, up from #3 to reclaim the #2 spot it held at the beginning of the year. Most of the remaining Top Ten Cryptos went the other way. Ethereum dropped to #3 from #2, Bitcoin Cash slipped to #5 from #4, Cardano is now at #10, dropping two slots from #8 last month. IOTA is down to #13 from #12 and Dash down to #14 from #13. NEM, Dash, and IOTA are Top Ten dropouts - they have been replaced by EOS (now at #6), Tether (currently at #8), andBitcoin SV (currently at #9). November saw $75 billion in value erased in the crypto market or about -36%. Definitely a painful month, but not the worst of the year. March was worse in both overall amount and percentage lost. The total market cap for crypto is now at its lowest month-end point of the year and from January 1st the market has lost -77% of its total value. Crypto hasn't ended a month above $300B since the end of May. One of the few constants this month: Bitcoin dominance basically held the month-end high it recorded at the end of October. As we've seen this throughout the experiment, when the overall market dives, BTC's dominance increases. If I cashed out today, my $1000 initial investment would return $161, down -84%. I'm officially at the lowest point in terms of value. After a few uncharacteristically dull months in crypto, the breakout we were expecting happened, but not the direction most were hoping to see. There definitely is a sense of hopelessness in the crypto space, an extremely sharp contrast to the mood this time last year. With only one month left to go in the year, it appears extremely unlikely that sentiment will change in the next 30 days. I'm also noticing more and more crypto commentators are disappearing or starting to change the subject. Stellar continues to outperform its peers and is in a good position to end the year at the top of this experiment. Focusing solely on holding the Top Ten continues to be a losing strategy. While the overall market is down -77% from January, the cryptos that began 2018 in the Top Ten are down -84% over the same period of time. 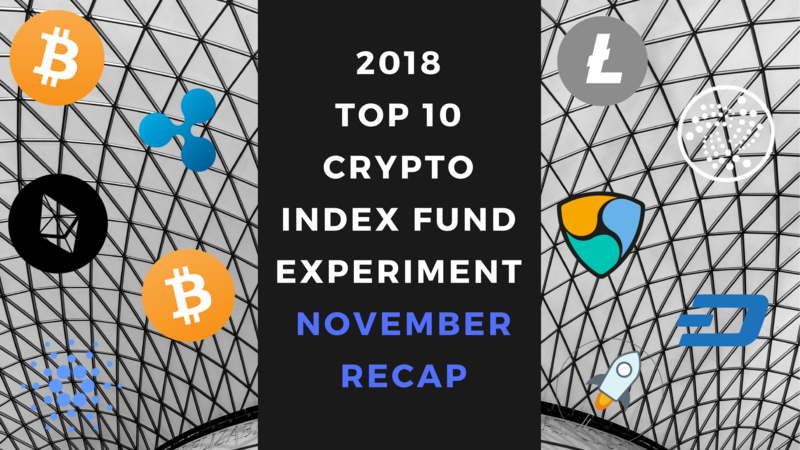 At no point in the experiment has this investment strategy worked: the initial Top Ten continue to under-perform compared to the market overall. But this month that gap narrowed to a 7% difference, from last month's 11% difference. I'm also tracking the S&P 500 as part of my experiment to have a comparison point with other popular investments options. November was again a volatile month - the S & P 500 finished up about 3.3% on the year meaning my $1k investment would have given me $33 on the year. Although November wasn't the worst month of the year for crypto, it certainly felt especially tough. Maybe it's the result of being beaten down all year, of yet another consecutive down month (cyrpto hasn't had a green month since the end of July) or the realization that 2018 probably won't be salvaged. Many seem to be abandoning hope, while the optimist ask: is there more room to fall or have we finally hit the bottom? Although I've received some interesting suggestions, I haven't decided yet what to do with the experiment after December. If any one has suggestions, let me know in the comments.